Now that we are moving on to the sites where the question of viability remains, we should do a quick refresh on the last real study of potential sites in the East Bay. Well, outside of the current MLB Expos Relocation Team Reunion Tour, that is. In December 2001 HOK presented a study on 7 potential stadium sites in the East Bay. Those sites (in order of preference based on the study) included Uptown (now condos), The Coliseum (please, no), Fremont (been there, done that), Howard Terminal (not viable), Pleasanton (now a planned mega development), Oak to Ninth (now slated for something else after much wrangling), and Laney College (ain’t gonna happen). That study used an established matrix that HOK had developed for evaluating each of the available sites in a particular region in relation to one another. The categories used to evaluate each site included Urban Design, Transportation, Site Factors, Cost and Timing. Each factor held equal weight with the best site in a particular category getting a score of 7 and the worst getting a score of 1. If two sites were judged to be equally “the best” they both got a 7 and the next best could get a score no higher than 5. All in all, it is an effective way to objectively rank sites. So what does this have to do with JLS West (pictured below)? It is safe to say at this point, based on what we know, that “viability” is not something we can really give a ruling on. As Tony pointed out, viability is in the eye of the beholder. It is very early in the game and there is a long road to prove the site ultimately viable. All we can do at this point is call a site “potentially viable,” or worth more exploring. For argument’s sake, we can say a “potentially viable” site is one that was in the top 3 of the original study. Why? Because the top sites not covered by condos were looked into by Mr. Wolff and Howard Terminal, the first “rejected” site, was number 4. So, let’s get to it and do it! Urban Design– I honestly think we can skip this category. Or, further we can just give this site the highest possible mark. 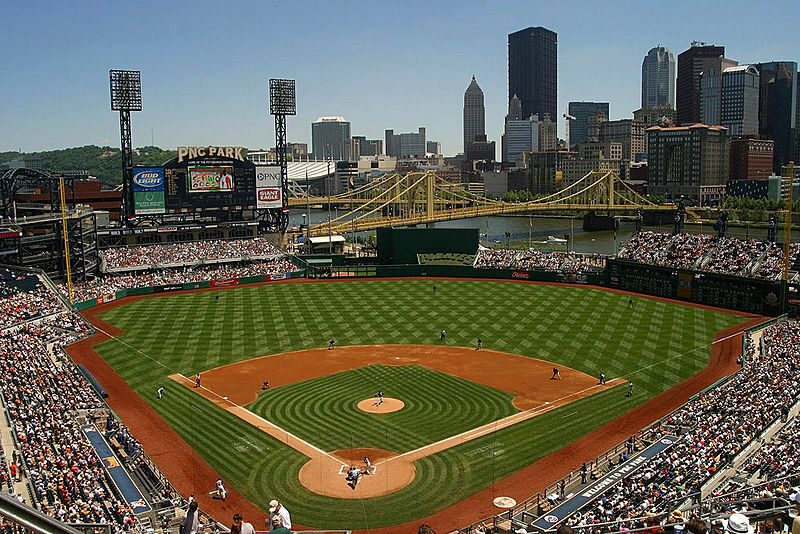 I envision a potential stadium in this site resembling what I consider to be the most aesthetically pleasing of all stadiums in the big leagues: PNC Park. Sure, there wouldn’t be a bridge or a river. But imagine the Oakland skyline looming beyond Left Field in a similar way and… Ahhhh, I can smell the hot dogs and taste the beer. This site is clearly a 7 on the HOK scale. Transportation– This site is not all it is cracked up to be from a transportation perspective. It is pretty comparable to Howard Terminal, which didn’t score so well in the original HOK study. The ferry is close, BART isn’t. Parking is a bit of a struggle, but not impossible, and the freeway infrastructure (on ramps/off ramps) in the area is just okay. I’d give it a 4 on the HOK scale, which is the same score Howard Terminal got in 2001. Site Factors– There are 57 separate parcels (per oaklandexplorer.com) in the area that is defined by the rectangle in the City of Oakland’s presentation. Those 57 parcels have at least 33 individual owners and include a few residences. Excluding the streets, this area is 14.2 acres. I wouldn’t anticipate a huge environmental clean up cost, but soil stabilization will be an issue. One potential issue is BART running through Left Field, but that becomes more of a footprint constraint than a deal breaker. In 2001, this site would have been better than Howard Terminal, probably comparable to Laney College. Those sites scored 2 and 3 on the HOK scale. In this case I will give it a generous mark of 4. Cost– Land Acquisition in this area, though complicated by the high number of parcels and individual owners, shouldn’t be outrageously expensive. The value of the buildings and land comes to somewhere around $25 Million dollars if we budget $25 per square foot for land and use the oaklandexplorer.com values for the structures. Business relocation will add to the cost, for sure. There would need to be some on site parking, probably a garage with 1,000 to 1,200 spaces. This site would be better than Laney College, Oak to Ninth, and Howard Terminal were when it comes to costs, though more expensive than Uptown, the Coliseum or Fremont. Which really isn’t bad or good, but right in the middle. I feel comfortable giving this site a 4 on the HOK scale for costs. Timing– While those 33 parcel owners might not drive up the cost of the site, they could become a factor in the speed with which the site could be developed. I imagine they could derail it altogether, but I don’t think that would be the case. In the original HOK study all sites but Laney College were tied for best. None were this complex, but this site isn’t as tough as the Laney College site was either. So let’s give it a 6 on the HOK scale. So that makes this site a 25 (with some rule bending for sure). How does that compare? I love this new posting schedule. Thanks Jeffery and ML! Great analysis! I love that it has been narrowed it to two and you can really dig into the details. One note, in order to get a view of downtown, you need to rotate the oreintation. It looks like if you do that the footprint does not fit into the site. I’m sure they could clip some corners, but it looks like a tight fit. Wonder how many packs of cigarettes it will take to get a view of the ballbark from your jail cell! Nice work Jeffrey. 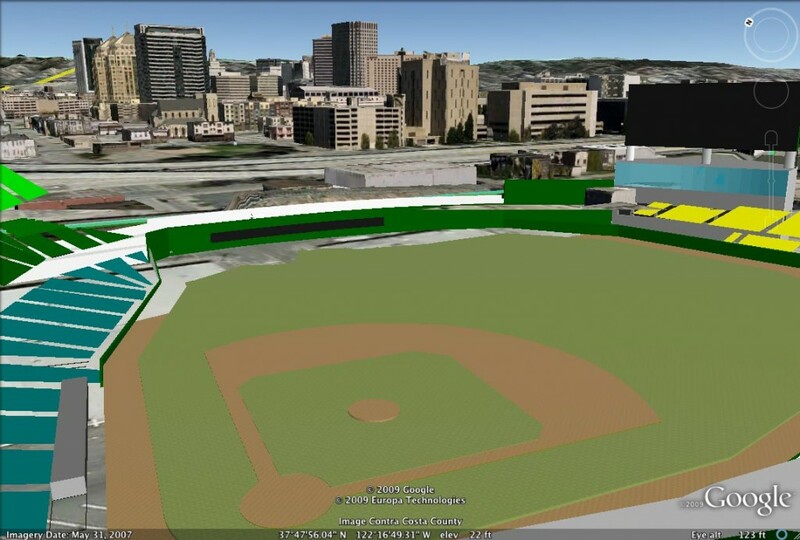 Taking my SJ partisan hat off, that area of JLS would be awesome with an urban ballpark. However, wouldn’t game-day traffic affect the port operations? If NUMMI had issues with Fremont, I could see the Port of Oakland perhaps raising a stink about this one. Nonetheless, great job! Here’s a thought; if Oakland looses the A’s, shouldn’t the city try keeping the teams that are still there? How about building an arena at JLS for the Warriors? Their lease at Oracle runs out in 2017. Perhaps the planning should start now to build a world class arena at JLS. Hey Tony, I didn’t really consider NIMBYism from the Port or anyone else. As I recall, the original HOK study didn’t either (see Fremont being one of the top 3 sites). I imagine the Port may have a few things to say about it, but that is part of the “worth exploring” questions to answer which we can’t really know at this stage. I imagine someone has talked with Port officials… it was odd to hear Jane Brunner refer to Howard Terminal as “empty” on Chronicle Live… I look at the Port’s website and it has tenants listed. Maybe she meant no significant structures? Either way, I expect NIMBYism in Oaktown at any site , including the Coliseum with the Warriors and Raiders cast in the role. The real question is can their objections be overcome and I don’t know without knowing the specifics of any objections yet to eb stated. I notice that Omar Benjamin from the Port of Oakland is one of the founding members of the Let’s Go Oakland thingy on facebook. So, with that group involved in the press conference, and Howard Terminal one of their sites, it’s a decent bet this won’t suddenly appear as a issue from out of nowhere. The NIMBYism in the case of JLS West would probably come from Chinatown. Every time that the City of Alameda decides to build anything on the west end of Alameda where I live, Oakland Chinatown complains about the traffic, since they’re an unavoidable thoroughfare. 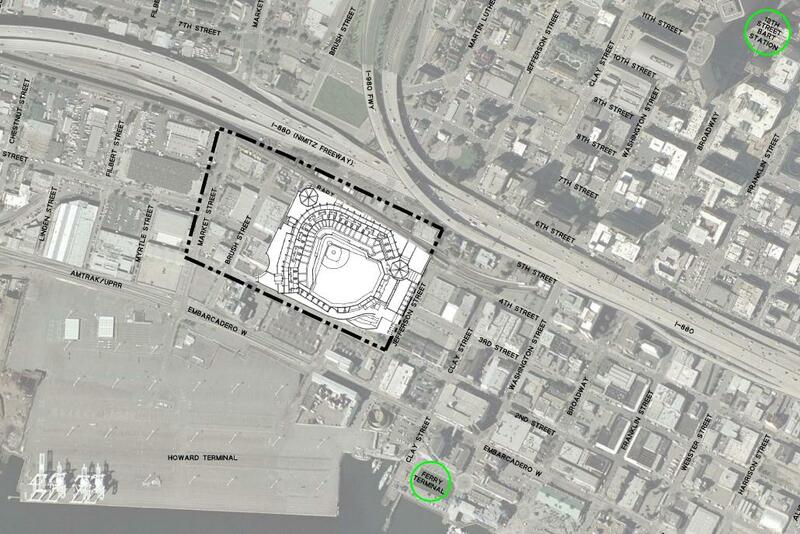 I imagine this ballpark location would add quite a bit of traffic through Chinatown, as well. I would personally love the JLS West location, since it would be about a five minute drive from my house, and I might even be able to see the top of the ballpark from my upstairs window. That said, I still think MLB would be insane not to take advantage of that prime location in San Jose. I am a big fan of yours. It is an honor to know that you have read my post. gojohn10 – I can’t promise we’ll be as prolific as we have been the last few days. We’ll be entering a brief quiet period soon because of the holidays. Mark – The site is a tight fit. Jeffrey asked me to do a quick superimpose, so when I did it made a lot more sense to orient it NE instead of SE. If it was SE, the area behind the RF wall would back up to the power plant, which isn’t good if you’re trying to build Eutaw Street or something like that out there. Orient it NE and the LF wall backs up the 4th St and BART, which is a much more natural fit. I laughed when I exposed the 3D buildings and saw that the now-shuttered jail has the best view. Interestingly, the parking garage next to it could be really good for the ballpark if it were available. Anyone know about this? The parking lot is the county’s no? next to wiley Manual courtouse. Do they not use that jal anymore? Is everyone transfered from santa rita? As far as I know that jail is still running and pretty busy since the OPD closed it’s jail a couple years ago. With the courthouse and jail there, I don’t think that parking lot helps a ballpark. Economic success of JLS aside, the article and some of the comments bring up accessibility issues. Are these significant? I have never set foot in JLS. If they build a ballpark there, I will come. Otherwise, I can eat just fine in Temescal. One obvious solution here is to combine the JLS/North ballpark plan with an integrated/infill BART station at 4th Street where BART runs through the plot. Funyy you say that, I have been researching costs for infill BART stations (West Dublin/Pleasanton and projections for Irvington) so I can understand what one here might cost. All I can say at this point is “it costs a lot” and if it were an actual requirement for this site it would make the “Cost” component pretty hard to swallow. I think they looked into that earlier and it was horrendously expensive. The bottom line costs for Irvington and WD/P are really high. Irvington is estimated to cost $100 Million while WD/P is estimated at $87.5 Million. I don’t quite understand all of the cost drivers so it is hard to translate those numbers to an imagined Jack London Square Station. I do know that the foundation for the WD/P Station was built as part of the original extension and that infrastructure does not exist at JLS. So it is safe to say that the cost here would be more than $87 Million. How much higher? How would it be paid for? I wish I had good answers for those. As far as transportation, the Bart is ist behind the Mariott in the mock up. I know its a cmfrotable 5 minute walk to the jail from there and just going beyond thefeeway would not add too much time. I think its fine for BART. It is about 10 city blocks between BART (12th Street) and this site. Not a struggle at all for me, but for the games I bring my children to… Access to JLS is an issue in general. I understand there is a Department of Transportation project underway to help a little bit, but really JLS and the Oakland waterfront’s biggest issue has always been that it is hard to get to for so many people. There’s always the old street car straight down Broadway idea. Not especially fancy, but bridges the downtown -> JLS gap pretty quick and painless. Maybe also go JLS to West Oakland and Lake Merritt BART to fully cover the whole overlooked waterfront mass transit situation. It is cool sounding idea. I wonder how much ti would cost? Are you thinking something akin to MUNI Light Rail type service? Wasn’t that like $600 Million to extend 5 miles or so down Third Street in San Francisco? Or did you mean like the Cable Cars and F Market & Wharves? This would be very cool… Who knows how much it would cost to make this happen? The study undertaken by BART several years ago determined that an infill BART station would be all but impossible. Due to the odd grade and curving alignment as BART exists the downtown tunnel, a new alignment would probably have to be constructed. The study did however recommend a streetcar system as a long term solution. The route would travel along Broadway from the intersection of Grand Avenue in the north to Uptown – Downtown – Old Oakland – Chinatown – Jack London Square in the south followed by a quick run down 2nd street to the Amtrak station. Based on similar projects in Portland and Seattle, expect the route to be about $30 – 40 million per mile including design, construction, rolling stock, signals, maintenance facility, etc. That would put a 1.5 mile route from Grand Avenue to Jack London Square at about $45-60 million. Granted that $45-60 million is a lot of money, it is certainly a lot less than any BART project or a standard light rail project (LRT about 3x the cost). Many cities have used a mixture of funding sources to get their streetcar lines moving. Seattle for instance funded their first line with $25.7 M from local improvement districts, $15 M from the federal government, $3 M from the state, and 8.5 from the sale of excess city property. Portland’s initial line used a mix of state and local funds, local improvement districts, and parking revenues/bonds. Plus, their newest extension is receiving $75 M from the federal government. It would certainly take some effort to get the streetcar project moving, but at $45-60 million, it is nowhere near the cost of the Oakland Airport Connector, the Central Subway, BART to San Jose, or BART to Livermore. At a fraction of the cost, the streetcar system would provide tremendous benefits to all of Downtown and especially a new Jack London Square ballpark. Jeffrey–this is great stuff but at some point all of these “adders” make the site way too expensive and complex–like the idea of dreaming outside the box but also need to keep it in perspective—otherwise it will be just that–dreaming. Finding the money to buy the land, relocate tenants, do the EIR is probably more than Oakland could swing right now…and remember that there is a huge assumption here that the owners are willing to build the yard out of their own pocket—may not be the case in Oakland—so there could be some additional financial requirements. Heh, actually, I went out looking for infill cost data and ran across a slick analysis of seemingly every possible transit project for JLS by a team of Oakland, BART, AC Transit folks. And they seem to like the streetcar idea best of all. Yeah GoA’s, I don’t think that adding street cars or BART are really something that should be considered as a part of the stadium construction. MLB or the A’s wouldn’t be paying for any of this stuff. Which is why I said above if it were considered a part of the project the “Cost” would be much worse than it was worth. As I understand it right now (this is from speaking with a few people who claim to be inside), MLB has given Oakland the directive that they need to acquire any land for the stadium, lease it to the team on favorable terms, clear any governmental hurdles and pay for associated infrastructure. Funding construction is up to the league (which means the A’s), though I imagine that may change. They are good ideas on their own is all I am saying. It’s up to Oakland to make those things happen and, on the surface, I would say they should be doing it ballpark or no. It’s been a while since I’ve read the JLS Feasibility study. It’s important to note that the cost was in 2004 dollars. It’s reasonable to add 10-15% at this point because of inflation, materials costs, etc. Any new transportation project would take too long to develop to get the benefit of today’s lower labor costs. Funny, I had forgotten that the study dismissed a BART station option at Market & 5th because of the track grade and limited space. Even if it were built, the 2004 cost would’ve been $250-300 million. Ouch. A free downtown-JLS bus shuttle is starting up soon. When I lived in Alameda, I remember wishing that there was some BART connector on the island. I know there would be a lot of NIMBYs, but I’d love to see a small line (I was thinking something like tram lines in Europe that sometimes go below ground, sometimes run through city streets, and sometimes have dedicated throughways) that went from Oakland City Center through JLS, on to Alameda with stops on Webster and Park, cross over to Bay Farm Island and meet up with the airport, then head back over to BART (maybe the San Leandro station). Of course this would also be really expensive… but it would kill 3 birds with one stone… er line. With construction for the Warm Springs BART station extension underway (they just started tunneling under Lake Elizabeth), and NUMMI going bye bye, the Fremont option would now score better than this site. However, my preference is to weight the urban design aspect of the park quite a bit. In that sense, I would much rather the build the park in downtown Oakland or San Jose than in Fremont, which is tough to say since the park would be in my backyard (for me… a good thing). No doubt. I was at the City Council meeting when it was announced the Warm Springs project was being switched from the alternative to the preferred plan…lots of angry people. I would love to see PNC Park along the water front. Or in downtown SJ, for that matter. PNC Park is in fact the nicest ballpark I’ve seen – too bad the current tenants aren’t worthy of it. Hey, that is awesome information!